With the average case of mastitis costing in the region of £250 a cow and an incidence of 40%, the UK dairy industry is facing a bill of about £4.5m a year. This means it is essential dairy herd managers do everything they can to limit the number of cases in their herds and ensure control methods are implemented effectively, according to Progiene’s Alison Clark. “Post-milking teat disinfection has been recognised as a key part of the mastitis five point plan and a central method in preventing new intramammary infections for over 50 years. Numerous studies have shown it to be a highly effective part of mastitis prevention and control with many studies showing full teat immersion via dipping as giving more consistent and effective teat coverage and hence protection than spraying. Teat dips also have traditionally been the only way to form a barrier on the teat to offer extra protection against pathogens,” she explains. As herds have grown and parlour throughput has become more critical then latterly the use of sprayable product has grown as the application method of choice with post-milking teat dipping viewed as time consuming. However, innovation in teat disinfection now allows a fully sprayable barrier product to be used on farm offering the best of both worlds for farmers who want the convenience of spraying with the protection of barrier dipping. Q - What is the aim of post-milking teat disinfection? A – Post-milking teat disinfection has several aims. The most obvious one is to prevent new infections entering the udder. Additionally, a post-milking product should moisturise the skin of the teat to help keep teats supple and aid milk let down at subsequent milkings. Q – What is the best active ingredient for post-milking teat disinfection? A – For effective protection against mastitis the best option is to use proven and recognised disinfectants. PVP iodine is a well-known and proven disinfectant and is also widely used in both vet procedures and human medicine, including many NHS environments. Q – Which PVP iodine products can be used for teat disinfection? A – Ecolab’s IoShield products offer trusted, and effective post-milking teat care providing an effective barrier and disinfectant to protect cows from new infections and maintain teat and udder health. Q – Is there a way of combining a PVP an iodine and barrier protection as a sprayable product? Barriers offer improved protection but teat dipping can be time consuming and slows the milking routine? 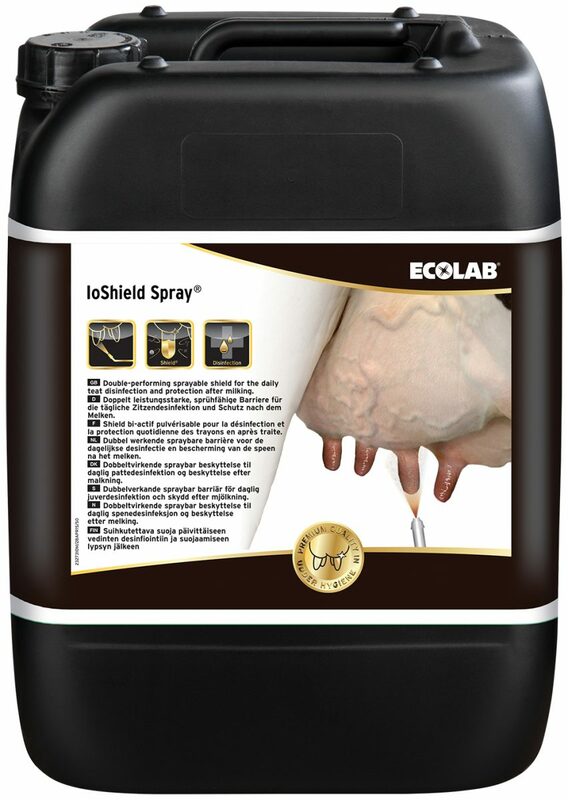 A – Extensive trial work has allowed Ecolab to develop IoShield Spray, a version of its highly effective PVP iodine-based teat dip which can be sprayed on to teats and still provide the same protective ‘second skin’ benefits as traditional teat dipping. Q – Why hasn’t there been an effective sprayable iodine-based barrier product before? A – There are other sprayable iodine products available, but none which provide the same protective barrier forming qualities as a teat dip can. IoShield Spray has been developed to have the same qualities as a barrier teat dip, but in a spray. Q – How has it been made possible? A – The biggest hurdle to overcome was making it possible to pass a viscous liquid through a sprayer. However, this has been done, meaning that the well-recognised benefits of a barrier teat dip are now, for the first time, available in a sprayable product. Q – What does this mean for mastitis control? A – The availability of IoShield Spray provides a great opportunity to improve parlour routine and keep new infections at bay. Sprayable products are quicker and easier to use, but haven’t historically been able to offer the protective benefits of a barrier teat dip. IoShield Spray utilises highly effective disinfection via PVP iodine with the formation of a second skin on cows’ teats, giving a shield against infection. Devon farmer Paul Harvey says he has found the ‘best of both worlds’ now he has been able to trial IoShield Spray, Ecolab’s new sprayable teat shield, and is confident a reduction in his herd’s somatic cell count is directly related to the product. Milking 180 Holsteins at Tunley Farm, Loddiswell, in the South Hams, he had always expressed an interest in a sprayable barrier with his farm merchant and jumped when they offered him the opportunity to take part in the trial. Mr Harvey says: “Our cell counts tended to sit at about the 200 mark, which meant we fluctuated between getting a bonus or not. With a herd average yield of about 9000 litres at 4.2% fat and 3.35% protein, and a cell count bonus of 0.3ppl, he says exceeding 200,000 cells/ml had the potential to cost him about £400 a month. However, he says he has always preferred the convenience of a sprayable product, so was loath to switch to a dip, despite the fact there were post-milking dips on the market which would form a barrier and offer improved protection against infection over conventional sprayable products. He says: “We have always employed a post-milking product via spraying because of the speed and ease of use, and I like to know a completely fresh product is used for every cow. He says: “It creates a sort of skin. It goes very orange and you can clearly see the coverage. He says: “Cell counts are now running at about 150 and my gut feeling is there is less mastitis around and the herd is generally healthier.